today.com/klgandhoda - The KLG & Hoda Give It Away! today.com/klgandhoda – The KLG & Hoda Give It Away Sweepstakes 2016-17. Promotional Giveaways on the Today Show with Kathie Lee Gifford and Hoda Kotb. No purchase necessary. KLG and Hoda Giveaway 2016-17. A purchase will not improve your chances of winning. Want a chance to win a prize? ($50 Value) – Enter KLG and Hoda’s Give It Away sweepstakes! Do you enjoy watching the NBC Morning Show “The Today Show” you will delight to know that they are sponsoring an interesting sweepstakes with weekly prizes. Indeed, to celebrate reaching more than 1 million fans on Facebook Sweepstakes, that’s a lot a fans for a Facebook page!!! KLG and Hoda are going to give 5 lucky viewers a special prize every Friday! 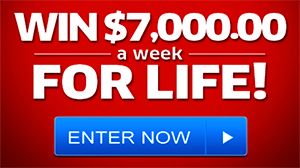 You must re-enter every week! For a chance to win you must visit www.today.com/klgandhoda and follow the on-screen instructions to enter this Today Show promotion. To enter the Sweepstakes, during the Sweepstakes Period visit http://www.today.com/klgandhoda (the “Website”), click on the Connect button and follow the provided instructions to complete and thereafter submit an entry form, which includes your name, address, telephone number, email address, and date of birth (the “Entry”). “PRIZE: There will be five (5) prizes awarded (each a “Prize”) with one (1) Prize to each Winner. Each Prize will consist of the following: an item or product that is featured on the TODAY Show on Kathie Lee & Hoda, to be selected by Sponsors in their sole discretion. Prize will be awarded “as is” with no warranty or guarantee, either express or implied by Sponsors. Prize is subject to certain terms and conditions as specified by issuer. The Today Show Sweepstakes “The KLG and Hoda Giveaway”. Hurry up for a chance to win great prizes that will be reveal during the NBC Morning Show. Good Luck All! I would like to win a prize. I need something good to happen in my life. watch you all while having my morning coffee. Your webpage will not allow me to enter the Give It Away contest this week. What is wrong? I watch your show everyday never miss it. If for some reason I can’t watch on time I will tape it. I tried sign up for give away but it won’t let me fill out my birthday. But I still love your show. Long term viewer (32 years watching), 1st time entering. So old I had to get on my laptop in order to scroll down to the year I was born. Can’t do it on phone or tablet!? LOL! Love that last hour of the Today show. Favorite is the Make Over Thursdays! The ladies drink their wine, I sit in my pgs with coffee cup in hand! Enjoy laughing, crying, and singing with my TV sistas!! Always learn something new with various segments. Couldn’t imagine life without that one hour!! And who knows, maybe I’ll get “beginners” luck and win? Good luck to all those entering!! I still enjoy watching your show. AWESOME SHOW WITH 2 AWESOME LADIES!!!!! PICK ME PLEASE COULD USE WINNING FOR ONCE. I wake up to you guys. I like real estate and beauty segments. You get my day off to a good start. HOW DO I ENTER THIS SWEEPSTAKES?????? I HAVE POOR COMPUTER SKILLS! I just registered. Don’t forget to pull my name. Love the Show and the Sweepstakes. Was able only to enter one time. Tried to enter the Sweepstakes and the form is not showing up. I tried to enter your contest but it would not take my birthday.We have to follow the rules,but you make it impossible.Is the contest fixed so no one can win. ???? I love you guys! I watch you every morning. Watch your show every morning. But can never get thru to enter the Tuesday give away. Is others having the same trouble? I love to watch Kathy Lee and Hoda. Thanks for a good show. I have tried several times to enter your weekly contest. Why won’t my entry go in? I hope your website has been re-worked. Kathy Lee and Hoda are so nice to do this give-away, but their people who run the give-away make it almost impossible for any one to sign up. Some one needs to look into this and solve this problem. Cannot put in birth date for Tuesday sweepstakes. Hi beautiful ladies how do I enter your sweepstakes? Let me in- I need to win. I love your show and would also love to win :) I watch you every day with my bird, Shaddow! Kathy Wolfe, retired living in Florida. 02/01/1950. Kathy Wolfe, retired living in Florida. I love KLG and HODA!!! I I watch it your show every day. I cannot enter sweep stakes?? I was able to enter 2 time never been able once, but never again, what’s up?? It is too hard to find the give it away sweepstakes entry. On the 9/7/15 show, I thought Kathie mentioned a contest having to do with anniversaries. I could not find it and my husband and I will be celebrating our 50th Anniversary in October. I would like to enter the contest if possible. Thank you. THIS IS THE 2ND WEEK THAT I AM UNABLE TO ENTER YOUR WEEKLY SWEEPSEAKS. WHEN YOU GO TO THE SITE IT ONLY SHOWS THE OFFICAL RULES, NOT ENTRY FORM AS IT DID BEFORE. WHAT’S UP WITH THAT? WHERE DO YOU GO TO ENTER. THIS IS NOT FAIR TO EVERYONE . I NKNOW THAT THERE ARE MANY OTHERS THAT HAVE THE SAME PROBLEM. PLEASE LET ME KNOW SO THAT I CAN ENTER BY THE DEADLINE WEDNESDAY!!!!! WOULD LOVE TO WIN ONE OF THE VERY NICE GIFTS THAT KATHY AND HODA GIVE AWAY ON FRIDAY. I WOULD BE SO TRILLED. LOVE TO WATCH THEM. I WISH THEY WERE ON FOR 2 HRS. THEY ARE GREAT. BOTH OF THEM. THEY MAKE MY DAY. Would be just wonderful to win a price from you special ladies. love your show and the both of you!!! You both make my day every day! I hope Kathy is not leaving. The chemistry you have together makes your show worth watching. I really enjoy your show ladies. I just recently switched over from ABC. Love you both so much! You make my day every day! Can’t go a week without you! I know it’s what everybody says but I really mean it!!!!! I got a little bit of KLG and a lot of Hoda!!!!!!!!!!!!!! I watch the show every day.have entered several times.Now it won’t let me do my birthday. Very disappointed. What’s up? I hope my entry made it in!! I went to enter by birthday & it disappeared? I absolutely love the show. I watch it every morning and I have even made the trip to see them live. I would love to enter the giveaway but it will not let me enter my birthday for some reason….. I also cannot enter my birthday. What is the problem. I also tried to enter giveaway contest but can’t find an entry form. Love the show especially the Friday funny. I memorize the jokes especially the one’s for my grandsons and everyone loves them. I can not find an entry form for the give away. What goes? Why can’t I enter my Birthdate??? Where do we sign up for the Friday giveaways? Thank you. I can’t find anywhere to enter the sweepstakes following the information in the rules. Can you pls explain how to enter? Thank you! unable to access sight for weekly contest. I want to sign up for the weekly Friday contest but can’t find it anywhere. Where do I go? Facebook? Today Show site? Please help. I watch every morning for several years. Used to watch The View but switched. I cannot get your site to work to sign up for fridays contest! It will not let me enter my birthday…love your show, love watching it everyday..long to enter into Friday contest. .please advise!! I watch your show every day and sometimes through the night. I would love to win something. I Like your Show. I watch it every morning. enjoy watching these 2 ladies, always entertaining and fun! would be great to win this week, thanks! Always enjoy watching these 2 ladies, they are entertaining and fun! Would be great to win this week. Thanks! Pick one from the UP o MI, the forgotten place of most people other than those who live here….